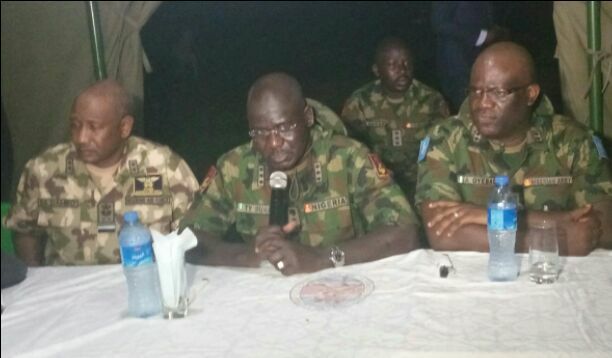 Chief of Army Staff (COAS), Lieutenant General Tukur Buratai, over the weekend reiterated the commitment of Nigerian Army to ensure professionalism in its engagements. COAS, who stated this when he stormed exercise base camp in Afaka, Kaduna to monitor performance and boost the morale of junior commanders to be deployed to North East in mopping up of insurgency in the region, said upon assumption of office, he promised to make sure the army is much better in terms of professionalism and has been working and trailing that line of action. Buratai noted serious challenges with the junior leadership in the North East region hence the need to improve on them to be able to command the troops effectively in the war front. According to him, “we have serious challenges with junior leadership in the North East especially the Platoon and company levels. I am here to see what is happening especially this phase of their training (outdoor training). To see areas that I will advise the college to focus on in the training of the junior commanders specifically. “I have seen the high standard of training, facilities and equipment used for the training. The Army Boss, who emphasized on the importance of the outdoor exercise, urged the junior commanders to replicate training giving to them in war front. He however commended the commandant for improving the facilities and equipments used for the training just as he urged members of the directing staffs to ensure the students participate fully in the outdoor exercise.